The first thought that comes to mind when I think of Kidorable is simply adorable! They bring imagination and creative play into durable clothing and accessories for children of all ages. From rain gear to knit gloves and hats to hooded towels. Kidorable is perfect for those rainy days and costume parties! I love the fact that their products are both functional and fun. As a mom, anything that can function in more ways than one is a bonus in my book. We recently receive an adorable lotus flower hooded towel. At first I didn't want to let my daughter use it. It's so pretty that it's almost a shame to let it get dirty and drug across the living room floor. She absolutely LOVES it! She wraps up in it and sit on the couch even when she hasn't taken a bath. My daughter uses it as a towel, robe and a blanket! How's that for a multi-tasking! Kidorable hooded towels are so soft. You can't help but rub your hands across them when you're close. They are also super absorbent, making drying off quick and easy. 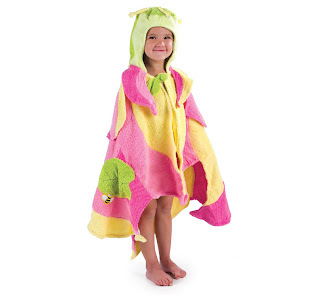 Kidorable's adorable selection of hooded towels are priced at $33 each. They come in two different sizes: 0 to 2 years, and 3 to 6 years. My daughter is 7 1/2 and the larger towel fits her just fine! Her reaction when I gave her the hooded towel, "WOW, this is the most beautiful towel I have every seen. I LOVE IT! Thank you Mommy!" A special thanks to Kidorable for this great review opportunity!